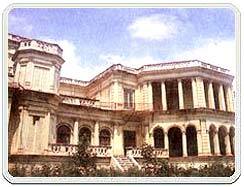 Built by Nawab Roshanuddaula the chief minister of Awadh (Lucknow), as his personal residence, Kothi Roshanuddaula is one of the classic examples of Indo-French architecture. During the time of Wajid Ali Shah, it was renamed 'Kaiser-Pasand' and made the residence of his favourite queen, Mashooq Mahal. It was transformed into the court office during the British period. The famous trial of Chhappan Chhuri, a well-known tawaif or courtesan of the period, was held here. Today, the Uttar Pradesh State section of Archaeology functions from here.